This integrated teaching unit combines actual fossil specimens and a wall-sized, 20×30" geologic time scale to provide a comprehensive introduction to the study of fossils. 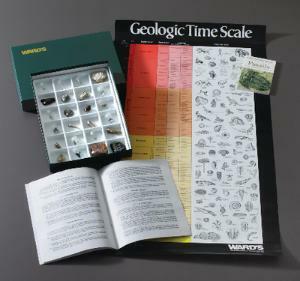 A ten-page manual describes the fossil record and the major divisions of the animal and plant kingdoms, as well as collecting techniques and equipment. The colorful time scale outlines the major eras, periods, epochs, and stages in North America and Europe, and depicts the major life forms through time with over eighty detailed illustrations. A pocket guidebook is also included. The set is housed in a compartmented collection box. Ordering information: Contents include 24 numbered fossils: Protozoa (2), Porifera (1), Cnidaria (3), Bryozoa (2), Brachiopoda (2), Pelecypoda (1), Gastopoda (1), Scaphopoda (1), Cephalopoda (3), Trilobita (1), Echinodermata (3), Graptoloidea (1), Chordata (2), Plant (1).